This image comes from an album owned by an officer of the Army Service Corps who was attached to one of the Indian Divisions in France 1914/15 and then in Mesopotamia (now Iraq) for the remainder of the war. Although private cameras were prohibited by the British Army this was a generation for which personal photography was in its infancy and the number of private albums I have come across indicates that many flouted the ruling. This particular officer took about 150 images while on active service showing some unique insights into service in two theatres of war and had them printed onto high quality paper and placed in an album. Sadly he forgot to caption them, but over the years I have been able to identify many of the locations; and images from the album will feature in future posts. 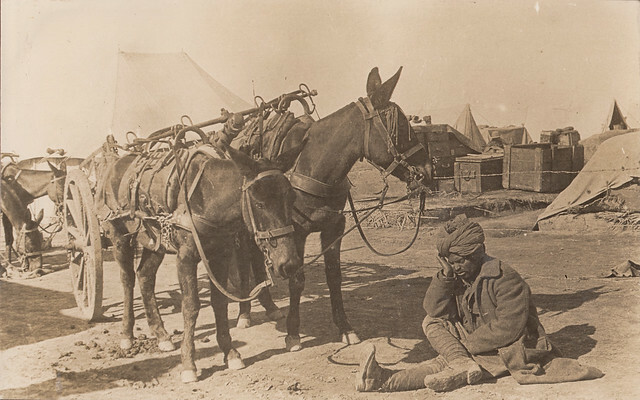 This particular image shows an Indian soldier fatigued by active service sat catching a short sleep near his charges, two mules who are pulling a British water cart. Water was a vital commodity in Mesopotamia – ‘Mespot’ to the troops – where the heat and lack of safe water supply meant that any clean water was in some respects as valuable as the munitions needed to feed the guns. Temperatures could rise above 120 degrees in the desert and to give an indication of the problem of sickness caused by issues like bad water more than 12,000 died of disease in Mespot during the war. The water cart in the picture could hold 120 gallons of water, which although sounds like a lot, the two mules would need 6-8 gallons each per day. It had its own filtration system and in terms of the technology of the day was quite an advanced piece of kit. This entry was posted on 04/01/2012 by sommecourt. It was filed under Indian Army, Mesopotamia, WW1 . Water was indeed so important to the soldiers that my grandfather, Sergeant Ralph E Smith of the Royal Engineers was issued a tiny booklet of useful phrases. My name is Denzil Joseph Victor Sequeira. I’m the grandson of the photographer P. Victor, who was the official photographer of the Mesopotamia Expedition Force. Would you have any photographs taken by him or any reference to him ? He also had a darkroom and processed film for photographers during that time under the name P. Victor & Co.
Could you please share some of his photos. They look very interesting. Thanks. My grandfather too served in WW 1 with Jodhpur Lancers.